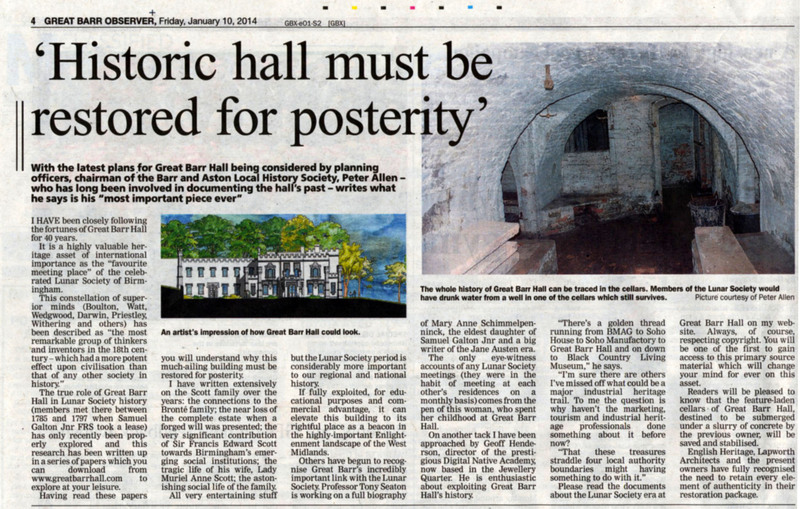 In the debate about the future for the Hall we have seen some incorrect comments about it and the history. Who better to turn to than Peter Allen for the history aspect. Peter is not for or against the development but is passionate about the restoration of the Hall, I share this passion. The following piece was in last weeks Great Barr Observer. of the hall and for the history of the whole area the Lunar Society links which shaped the West Midlands and the world. Even Asda have recognised the Lunar Society ! So I urge you to have a read around the site, understand the history and more importantly learn about the past mistakes that we can not unwind. January 14, 2014 in news, Pheasey. As Ian has I would advise anyone who wants to know anything about Great Barr Hall to read what Peter has written.